This is again the same time of the year - a nice blend of full bodied wine glasses, nutmeg on eggnog treats, gingerbread cookies, red ribbons and Christmas trees. My "favorite things" list for the end of the year is now ready. Some will make perfect gifts, others are just good at any time. The list does not fit all the wonderful items I discovered this year. Let's say it's just only the beginning of an ongoing culinary exploration. Happy Holidays and Have Fun! For the sophisticated globetrotter: The Fruit Hunters. Adam Leith Gollner’s book is a celebration for biodiversity and takes readers from Miami to Hawaii and from Seychelles to Cameroon. In an admirable around the world adventure in search for the uncommon, forbidden, sticky and exotic fruits that are not largely available in the kitchens of the Western world, the book explains why some fruits are mass produced and why others are ignored. Director Yung Chang made a colorful movie out of the book. Viewers will be fascinated with the lead characters - the inventors, the smugglers and the epicures - and puzzled with obsessed fruit hunters but after this movie they will honor a reinvented relationship with fruit. For the party goer: Tiny Food Party! It is a must-read for a fun and bite-sized treats. Teri Lyn Fisher and Jenny Park's book will teach you the art of making canapés. You will be amazed with the originality of world cuisine recipes like Kimchi Deviled Eggs, Arepas and Bolinhos de Bacalhau. For dessert, go for the Candied Bacon Churros or simply Eclairs and say cheers with a glass (or two) of Raspberry Champagne Cocktail. 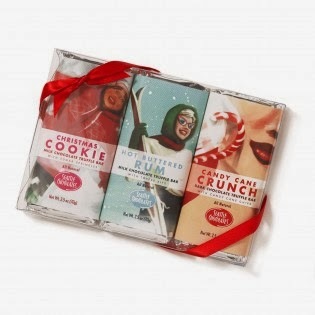 Three chocolate bars with a retro, Mad Men-style design come together in this celebratory pack of Christmas Cookie, Hot Buttered Rum and Candy Cane Crunch bars tied with a seasonal bow. 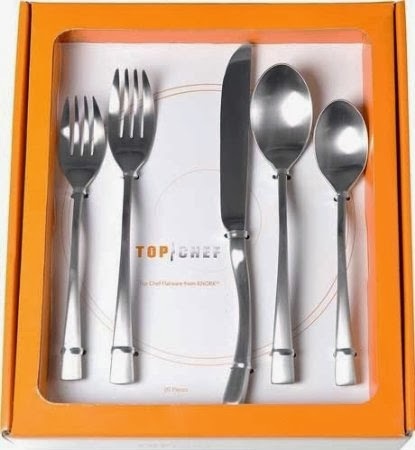 You may not be on the world-known television set to film, but you can always buy Top Chef 20 Piece Flatware Set. This stylish set of 20 pieces is made with 100% forged stainless steel and has 18% chromium for durability. They are also fun to hold! Get it for yourself or as a surprise gift. It was about time. We finally have some Onion Glasses. Just put them on and stop crying the days you peel the onions. Forget about all the techniques you have been told before. Available in a number of colors too. The Doodle Lunch Placemats will make lunchtime fun with your little one but also an educational session. Turn letter A into an alligator and Z into a zebra. It’s easy to use and tear-off. You can also get them for Breakfast and Dinner. And this is me. I can eat savory snacks throughout the day and I like all brands and most flavors. This year I pick the new brand Hardbite from Canada as my favorite. 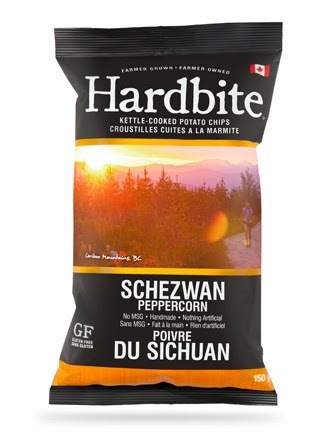 With a nice range of flavors including Jalapeno and Schezwan Peppercorn, bites won't be too hard after all. Bocelli's Sparkling Brut Rosé Wine is pleasant, easy to drink and has the perfect color. 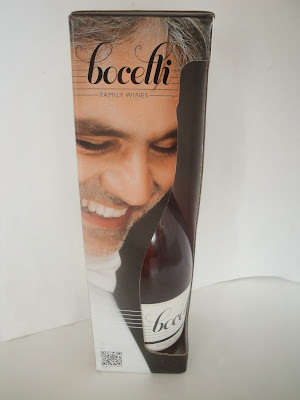 Excellent as an aperitif but also with finger food and canapés, it may well be a nice selection to your festive cellar. Enjoy and say cheers to Andrea!